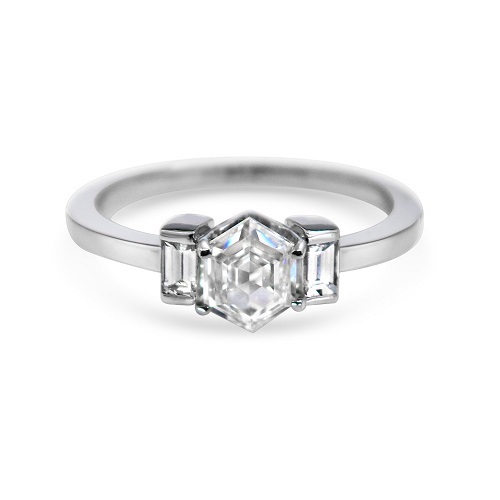 Hexagon engagement rings manage to be contemporary enough for today's era while still having enough timeless appeal to make them a favoured choice throughout history. 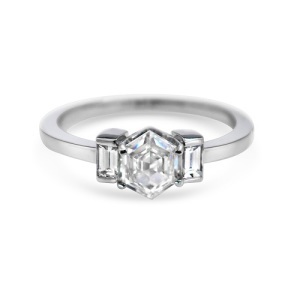 Popular in the art deco era, the rings have a classic yet interesting appeal that makes them extremely versatile. 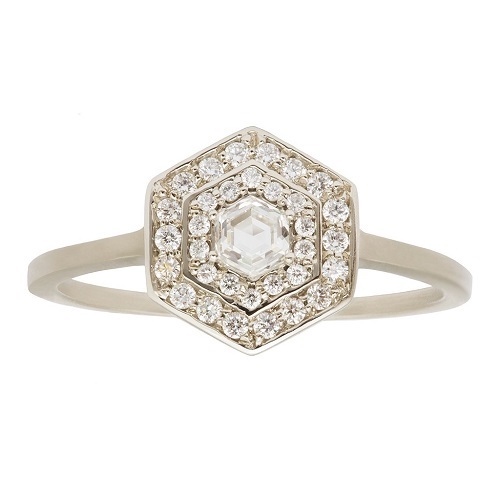 Keep reading to find out how to infuse some geometric engagement ring charm to your ring with a hexagon-inspired design. If you're looking for a ring that is unusual enough to be interesting and different while still being elegant and understated, hexagon engagement rings are a great choice. Here are some examples of this gorgeous ring style to give you some inspiration. 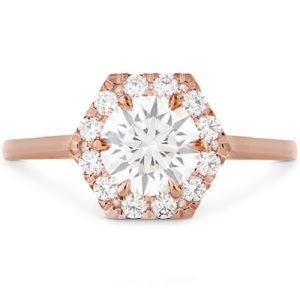 The hexagon shape is perfect for the halo design, with tiny pave diamonds added around the six edges of the hexagon in a way that adds plenty of sparkle and shine. A round diamond takes centre stage, accentuating the tiny round stones around the edge. Rose gold adds to the femininity of this ring, but yellow gold, white gold and even platinum would also work well. The only thing more romantic than a halo is a double halo. In this design, two layers of pave stones surround the edge of the hexagon, with larger stones around the outer age and smaller stones on the inside. 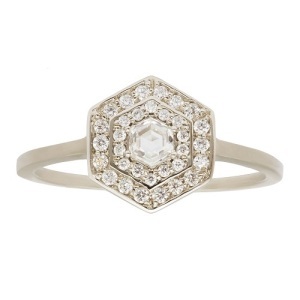 A hexagon cut diamond in the centre further highlights the shape of this vintage-style ring. Whichever metal you prefer, this ring is eye-catching and sophisticated. 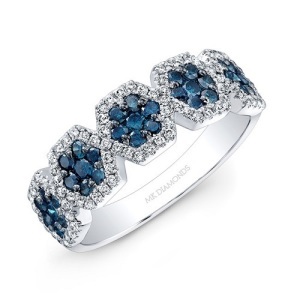 For something a little different, blue diamonds add even more impact to this design. Five halo hexagons are placed alongside each other in a chain. The inner hexagon shape is made up of tiny blue diamonds that give the ring the look of a flower chain. A halo band surrounds the blue flowers, connecting the chain and adding maximum sparkle. If you favour rings that veer away from conventional, you are sure to love this design. It would work equally well in any metal with just about any colour of diamond or any type of precious stone. 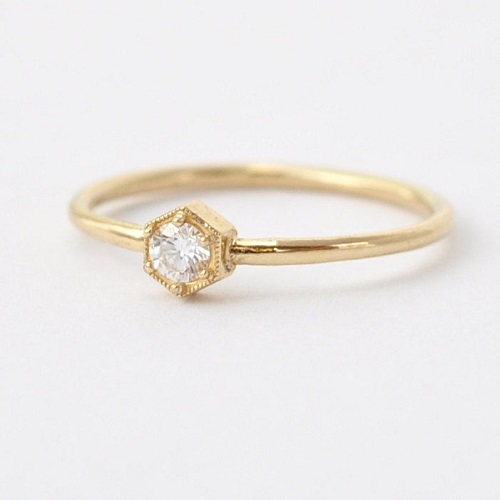 Perfect for those who prefer their rings on the minimal side, this delicate ring features a teeny tiny hexagon design with a dainty centre stone. 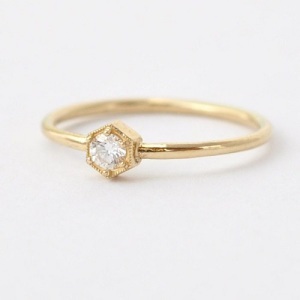 Set on a fine gold band, the ring has just enough sparkle without being over the top. 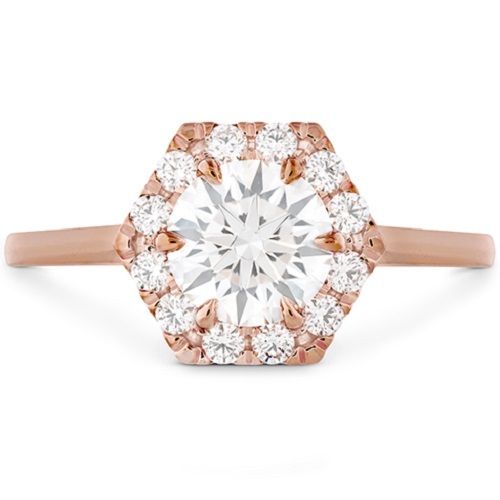 Rose gold would also look lovely, while white gold and platinum would work well, too. Choose a white diamond or try something different such as a coloured diamond, sapphire, ruby, emerald or Tanzanite stone. 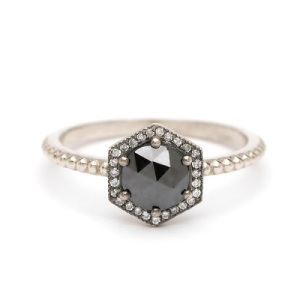 There is undoubtedly something alluring about black diamonds. These rings have a bold yet elegant appeal that is timeless. In this ring, a large black diamond centre stone takes centre stage, with the tiniest of pave stones dotted around the edge and continuing along the band. The band is kept fine to avoid detracting from the stone in the centre. White gold and platinum work especially well but rose or yellow gold would add lots of impact. Another stunning example of geometric design, the three stone ring design is given a modern edge with two baguette stones that flank the centre hexagon. Round stones would also work, or even smaller hexagons, trillion stones, cushion cut stones or even marquise or pear cut stones. Whichever stones and metal you choose, this ring has plenty of creative choices to offer. Looking for an exquisite custom-made ring in Cape Town and surrounds? Cape Diamonds helps make your ring dreams come true with beautifully made personalised rings that are made to order. Get in touch to find out more about our hand-crafted engagement rings.